After years of estrangement from her family, Mags receives a shocking phone call. Her rebellious brother, Abe, is in a coma, and the police suspect he tried to take his own life. But Mags isn’t so sure, and she begins to crack away at the life of the brother she once knew: the dark apartment building, the whispering tenants, and her brother’s mysterious girlfriend, the only witness to the incident, who raises more questions than answers. As Mags picks up where the police left off, she begins to unearth the secrets her brother left behind—and awakens her own talent for revenge. Sarah J. Naughton grew up in Dorset, the only child of a single mother. At seventeen, she moved to London to begin a degree in English literature at UCL, after which she worked as an advertising copywriter until the birth of her first child. Her debut novel, The Hanged Man Rises, was a thriller for young adults based in Victorian London and was shortlisted for the 2013 Costa Book Award. A second teen thriller, The Blood List, dealt with seventeenth-century England’s deadly obsession with witch hunting. 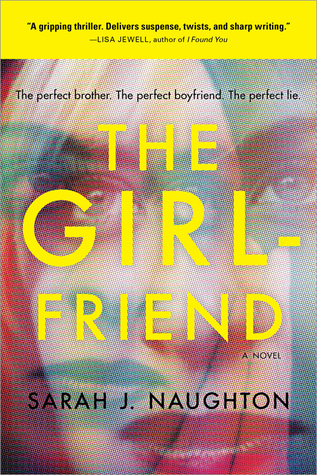 The Girlfriend is her first novel for adults and will be followed in 2018 by a second psychological thriller. Sarah lives in London with her husband and two sons. Mags Mackenzie is a criminal lawyer in Las Vegas. She gets a call that her brother Abe threw himself down the stairs in his apartment. The police are quick to call this incident a suicide. But Mags thinks there is more to the story. She moves back to London in Abe’s apartment. There she meets his girlfriend, Jody. Something doesn’t smell right and the deeper Mags digs the more she finds that Abe has a lot of secrets. This is one heck of a thrill ride. I was kept on the edge of my seat and flipping pages to try and figure out what was going to happen next. Mags works defending criminals and con men so she is quick to question what happened to Abe. But when she gets to his apartment, meets his girlfriend, and his questionable neighbors she thinks that there is more to this. This is a great thriller. There are little clues dropped that you don’t realize how important they are. I was not expecting the ending but looking back it makes sense. If you are looking for a really good thriller I recommend checking out this book. I would like to thank Sourcebooks for the opportunity to read and share this book.